This is a test kit which contains a single one ounce container for 21 of the colors in the Off Boradway lineup, also includes Clear Flat & Clear Gloss. Great for small scale mock-ups or just to experiment with colors! Off Broadway scenic paint is one of Rosco's most popular paints. A palette of rich, matte theatrical colors in a flexible vinyl acrylic binder makes Off Broadway paint perfect for almost any theatrical or film application, interior and exterior alike. Off Broadway can be used straight out of the can or diluted with water and applied to virtually any surface in stagecraft including muslin, wood, metals, wallboard and many plastics. 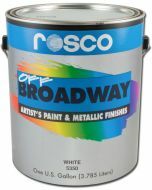 Off Broadway is compatible with all other Rosco scenic paints. Available in 27 artists' colors and 5 metallic colors. DilutionMay be used straight out of the can or diluted with water, Rosco Clear Acrylic Glaze or a combination of the two. Diluting will reduce the color concentration and create "glaze" effects. Diluting with more than 2 parts water may reduce binder strength. Add Rosco Clear Acrylic Glaze to restore adhesion and flexibility. Surface PreparationSurfaces should be clean, dry and free from dirt and grease. Prime porous surfaces, except fabric, using Rosco Tough Prime. If painting a new plaster surface, prime wall with a commercial primer/sealer designed for raw plaster. Then use Rosco Tough Prime as a final preparation. ApplicationStir contents well before each use. Do not shake. Apply by brush, roller or spray gun. Apply in thin, even coats, using a good quality brush or roller. Use overlapping strokes, keeping a wet edge. Change roller direction often to avoid patterns and streaking. Average Dry TimeAt 75°F, dries to the touch in approximately 30-45 minutes. Can be recoated in 1-2 hours. Shelf LifeMinimum shelf life for unopened, sealed paint is approximately 24 months when stored in a temperature controlled location. Excellent article on how to prepare a raw muslin drop for painting, specifically squaring and sizing fabric. Overview of how one scenic artist paints Christmas trees, and which Off Broadway colors she recommends. However its great for making new props and scenery look dirty, aged, and gross!